When we set out to determine what’s the best pressure washer under $200, we started by looking at the best sellers. Then we broke down the pros/cons of each and narrowed down the best under $200… If you don’t care about reading the good and bad of each pressure washers, scroll to the bottom of the page and you’ll find our top pick for under $200. 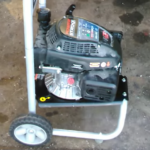 All of the major pressure washers at this price point come with wheels, which you’ll know is a bare-minimum for me if you’ve been reading the blog for long enough. Most of the pressure washers have commercially available attachments they can click into and be used for other purposes, which is an added bonus you get for bucking up and paying a little extra when you buy your pressure washer. All the washers at this price point have somewhere between 2,000–2,200 PSI, and you can choose between both gas or electric, so you have a lot of good options. What Sets These Pressure Washers Apart From Each Other? Quick overview of the differences between pressure washer models in this price range. 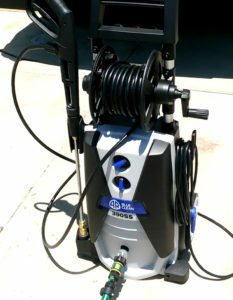 This PowerStroke is a 2,200 PSI gas powered pressure washer with 3 fan nozzle tips (a 25 degree, a 40 degree, and a low pressure soap nozzle for soaping surfaces before pressure washing). The soap nozzle is great if you’re washing a lot of cars at home, or if you find yourself cleaning large walls and concrete areas. This washer runs on a 140cc motor and weighs just a touch over 32 pounds. Each tank of gas lasted between 1–2 hours (depending on use, obviously). The thing that turned me off of the PowerStroke 2,200 was the recent negative reviews (you can read them on Amazon). Beyond that, I love that it’s gas powered (sounds mean while it’s running!) and from my personal experience, this is a great machine – I had no issues with the one I used. Read more about it on Amazon. 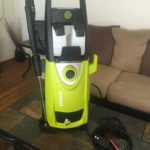 It comes with 5 spray tips – that’s 4 different tips of varying spray angle (in degrees), plus one specific for soap – and this pressure washer is great for medium and heavy-duty cleaning tasks. Looking to clean up your back deck? Looking to clean up your barbecue grills? Looking to clean up your front walkway after years of the Sun beating down on it? Then the SPX3000 is a great option for you. 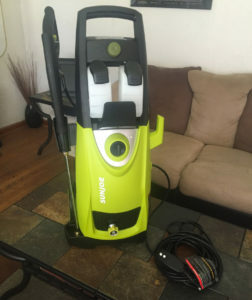 I loved that the SPX3000 turns itself off if the trigger is not engaged – I see this saving you money on energy bills and extending your pressure washer life for up to a year or two. It comes with 2 different detergent tanks, which prepares you for multiple jobs, surfaces if need be; each tank is 900mL and removable. Read more about it on Amazon. The AR390SS is a 2,000 PSI electric power washer you can expand on the basic unit with accessories that can be found easily on Amazon (here and here). it comes with a one-year limited warranty (warranty can be found here) and weighs 34 pounds. It comes with a pretty standard 35 foot cord that plugs into a wall outlet, as well as a 30 foot hose for your wand. Cooled motor means you can run this continuously, unlike most electric motors. Read more about it on Amazon. 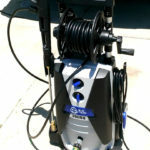 We ended up choosing The AR Blue Clean 2,200 PSI electric pressure washer as our top pick for under $200 and a large part of the reasoning there was the cooled motor which allows the pressure washer to run continuously something that a lot of the electric pressure washers we’ve reviewed have fallen short. This is a limitation in electric motors that is rectified by using a cooled motor. It’s also nice to have 2200 PSI for when you want to crank up the pressure and work on jobs a little heavier duty than you initially expected. Is This Your First Time Buying? Learn the critical mistake to avoid when buying your first pressure washer with our Quickstart Buyers Guide! All set! You should receive the Quickstart Buyers Guide in the next few minutes!